There is a school in New Jersey where they release an online gambling report in order to observe the different behaviors of an online gambler in the area. This is done as an effort to promote responsible gambling rules. Rutgers University’s last report showed data that’s very interesting and can raise hopes in every online gambler that considers playing poker as a hobby. The report released by Rutgers University states that most of the New Jersey online casino players are only using one account. 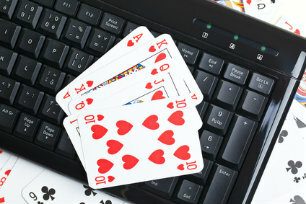 There are numerous websites to choose from, but the 2014 and 2015 online gambling reports show that the players who are using one account rose from 69% to 72% in just one year. Take note that only 14% of that population in New Jersey are registered on two websites only. This means that players in New Jersey are actually loyal to the poker platforms that they are visiting, and are not grabbing odds on different platforms at the same time. But there is one problem: there is a certain group that uses multiple accounts to reap huge winnings. The Rutgers University researched that this multiple account usage is increasing in size from 2014 to 2015. This research also shows that the majority of players tend to search websites probably because they preferred it only, hence the reason why there were some who are using 2 – 3 accounts. New Jersey online gamblers are now categorized into loyalists (those with one account), discerning users (2 – 3 accounts) and the “Mercenaries” (4+ accounts). The loyalist category simply shows that a player is just looking for the right environment. But it’s understandable that there are some with multiple accounts that are roaming across different sites, but still has their “home” casino where they reap the best rewards. These “mercenaries” are typically monopolizing the RTP rates of casinos. Going back to the loyal players, their reasons may vary a lot. Some may be loyal because they had fun with the community, some feel lazy to sign up (which is the most typical reason for average gamblers), and there are some who like the website all-in-all. But there are sets of reasons for those who have two to three accounts. Some of them had bad experiences on an old site, prompting them to move to a new one. Some may be future mercenaries that are studying how the gambling market works, and others are simply testing one site to another. But the mercenaries with the highest number of accounts may be someone that’s just comparing sites based on experience and not just reviews, some are just testing out again but in a large scale, but others may be real mercenaries. These are the ones who join various tournaments in order to get the best winnings possible; the most dedicated poker players, and of course the pro players. The statistics of comparing online poker players is what makes every gambler figure out the market of online poker itself, and how their budget and their preferred gambling style will determine their income.